Stephanie and Giancarlo's July 4th long weekend wedding was definitely one for the books! They gathered with friends and family for an intimate outdoor ceremony and amazing reception to celebrate their new marriage. The wedding took place at Oakview Terrace which allowed the gorgeous decor designed by the Trade Sensation Team to standout tremendously. The wedding had a classy look with colours of pink, white, and gold. Stephanie and Giancarlo used the Trade Sensation Team for Decor, as well as Wedding Planning. They were at total ease while the Trade Sensation Wedding Planning Team did what they do best, plan and execute! The night was filled with nothing but happiness and love from the couples family and friends. Stephanie and Giancarlo, we hope you have the most amazing life together and thank you for allowing us to be a part of your special day! 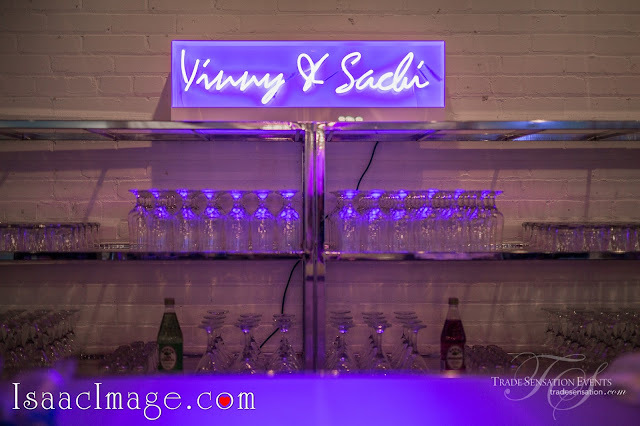 Sachi and Vinny's South Asian and Japanese Fusion wedding was celebrated in style on June 20th 2015. The couple gathered with friends and family for a fun, and unforgettable night at The Warehouse at Downsview Park! The unique warehouse venue was decorated with a modern glam look with colours of silver, lilac, and white. 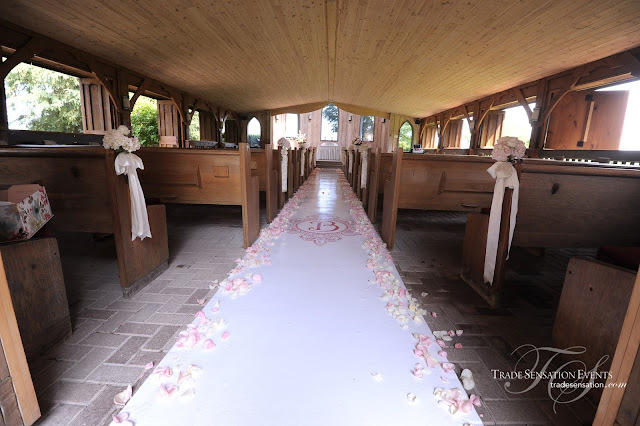 The Trade Sensation Team was used to its fullest advantage with its Wedding Planning, Decor, and Floral Team on site. The decor was designed by our very own Décor Team Leader Jasmin , to which she created a glamorous modern backdrop and silver sequins table design, and the floral arrangements were done by our very own In-house Floral Designer Natalia Fernandez. Overall it was a magical night filled with laughter and love! Sachi and Vinny we wish you all the best in your many years to come! 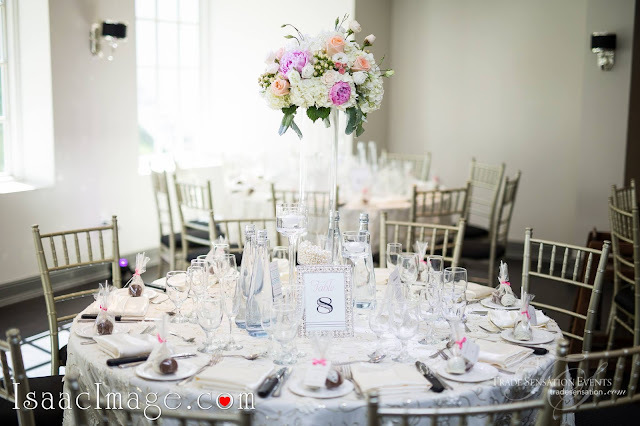 Christina and Serg's vintage wedding was celebrated on June 20th 2015. The couple gathered with friends and family for an intimate and unforgettable night at The Doctor's House in Kleinburg, ON! The historical venue was decorated with a vintage chic look that included colours of ivory and pops of magenta and blush pink. The Trade Sensation Event Director - Carla created an soft elegant design to compliment the pops of colour throughout the entire venue. Our Newest Chelsea Head Table design on both head table and cake table was a vision. The floral arrangements were a custom design created by our very own In-house Floral Designer - Natalia. Overall it was a magical night filled with love and happiness! From the Trade Sensation Team to Christina and Serge, we wish you all the best in the years to come! Melissa's Coco Chanel Themed Bridal Shower was an unforgettable day! Guests were given a classy elegant design that was the talk of the party at the Trump Hotel on June 28th 2015. 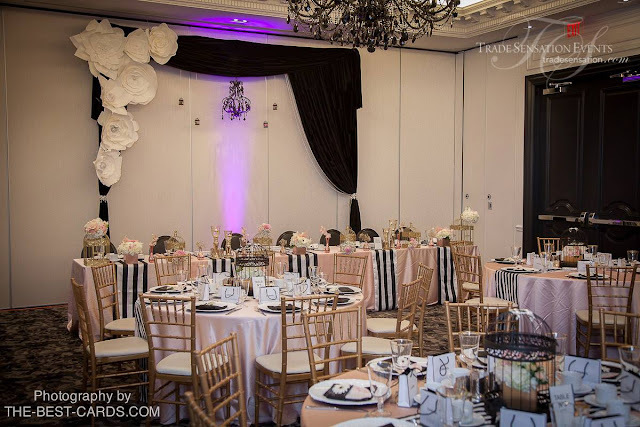 The Coco Chanel design was a custom creation by Carla Event Director and Melissa the Bride. We went with blush pink as our main colour, with accents of black and white stripes, and gold accents to tie the theme together. The Trade Sensation Team was used as a triple threat providing Decor, Floral, and a little bit of Event execution for Melissa's Bridal Shower. Yeah Melissa we are counting down the days until your Wedding, where we are doing WPlanning, Décor and Floral. Nelson and Mona used the Trade Sensation team as a triple threat with our Wedding Planning, Decor, and Floral services. Their Portuguese and Muslim fusion wedding took place at the lovely Millenium Gardens and had a very elegant look with colours of Ivory and Gold. 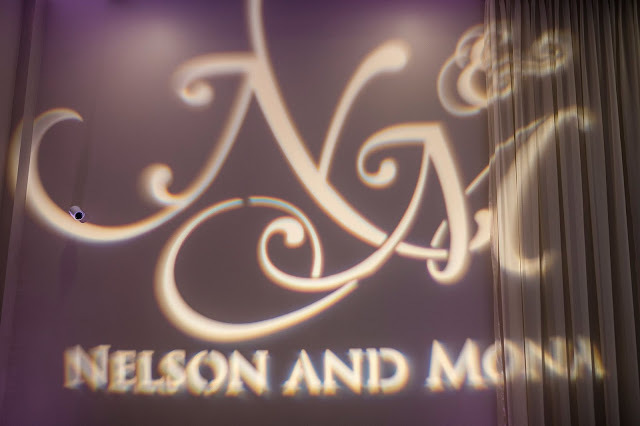 Thank you Mona and Nelson so much for having us at your wedding it was truly amazing!